Many of us are unaware of the fact that more than 56% college students are on LinkedIn. This really shows the higher interest of students towards establishing the best profiles until they reach the professional life post-graduation. In actual, the students who get worried earlier about landing a good job actually get success earlier because of spending many hours on the searching process. 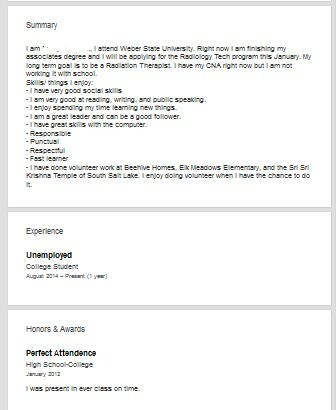 Benefit from the real college student LinkedIn profile review help we are ready to provide! Order our professional help now! Your profile picture and headline are two of the most important and most viewed elements of your profile. 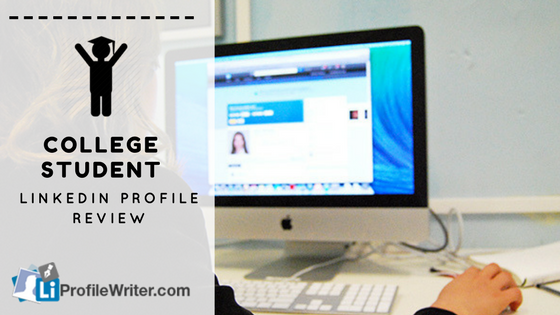 Having a profile picture increases the possibility of your profile is viewed by a recruiter or future employer. Instead of saying ‘unemployed at college student’ in your headline, consider updating it to say ‘Radiology Tech Student a Weber State University’. This will give visitors to your profile a better understanding of who you are. In your summary section, you give an overview of your background. Make sure that the information listed here is also reflected in the appropriate profile sections, including volunteering, education, and skills. Although you have mentioned your CNA in your summary, it is not reflected in your education section. LinkedIn allows you to have up to 50 skills in the skills section of your resume. Your skills should reflect your background and give a better understanding of your abilities. Instead of listing ‘computers’, list the specific hardware or software applications that you are familiar with, such as Microsoft Windows or Word. 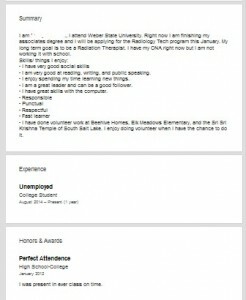 Review your profile for spelling and formatting issues. Your profile currently lists that you will be starting at Itineris Early College High School in May 2014 yet your summary says you are currently in college. In your honor and awards section, your perfect attendance award is described as “I was present in every class on time”. You currently have 8 connections. Adding connections, including friends, family, fellow volunteers, and classmates will increase your chances of your profile being viewed by companies that would be interested in hiring you. You might be also interested in our sales associate Linkedin profile review. As a student of the college, you must focus on making basic improvements in the profile. Don’t go into the depths for creating a professional profile. The headline must show that you are not professional yet. However, that shouldn’t sound too childish as well. Jump into the summary’s section. There, you can write about many things more about the educational career. Share your future goals and interests in the professional life. This can show your actual interests to the readers. Make sure that you avoid adding buzzwords. Everyone knows that you’re a college student. So, try to keep the profile simple without using complex words i.e. dedicated, hardworking etc. You can work on self-branding by making videos on YouTube and creating blog posts. This will definitely have a great impact on employers. They can consider you for internship programs. Write the correct and true information. Remember that in case of selection for an internship, you would be asked to submit all major credentials. Write everything by showing welcoming attitude. The more interesting summary you will develop, the higher chances would be to get best opportunities. The Work Experience section should leave empty but try to fill it up by including some info i.e. certifications, internships etc. Start making connections. This can help you to land job earlier post completing graduation. We will gladly tell you more of our tips and tricks to follow! Find out how you can get a professional help! These days, there are many college students that prefer building their college student LinkedIn. They are wiser than those who skip signing up for the professional profile. When you start working earlier on the LinkedIn profile, it will help you to develop connections in large number and getting more work opportunities. An anonymous has said the best line about success in both professional and practical life. H/she said, “Work Hard, Dream Big”. There are no doubts that people who work hard actually get the key to see bigger dreams. Never take the reading process for granted. This can actually help you in rectifying grammar errors and for doing proofreading properly. The summary must take at least an hour or two to be written. Edit it properly before updating. Change the headline that can actually rock and force the readers to view the profile from beginning to the end. Make sure that you also have to use a personal photo. The picture should look professional with no doubt.